There is a rapid transformation of legacy network of various Telecom Service Providers to support IP & Multimedia services, especially after the advent of 5G, NFV & SDN plus usage of IoT in Telecoms. And hence Network equipment manufacturers (NEMs) always face consistent challenge to accomplish the development, testing and deployment of new network elements quickly; that offers a wide range of value-added, revenue generating services etc. Telecom Service Providers (TSPs) are working to either build new networks or enhance existing networks to support new technologies and growing end user demands. TSPs face numerous challenges in an effort to provide high quality and much experience on the new service while ensuring that the existing services are not impacted. In the mean-time, Telecom Equipment Manufacturers (TEMs) face the challenge of keeping pace with TSPs requirements and ensuring consistent quality on their Telecom products. The optimization of various Test cycles is visualized as a key requirement for TSPs and TEMs in the same way. Test automation is a key enabler for the requirement which can help minimize the process or results of guessing and human error. Hence there are significant challenges of testing such complex network elements in a service-oriented network in terms of Quality, Interoperability and end-user experience etc. 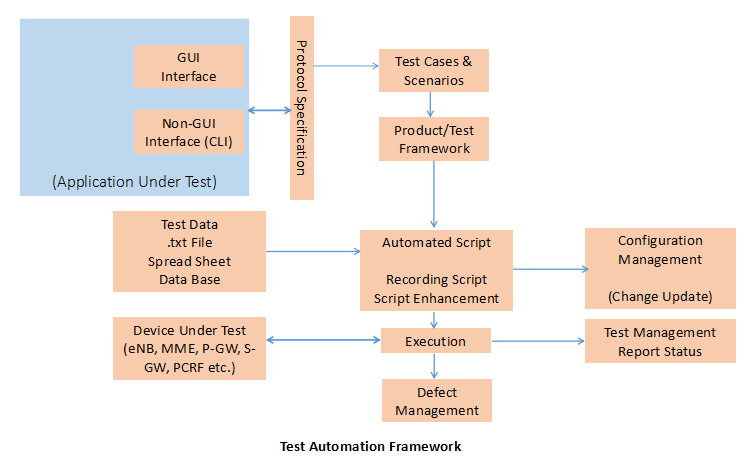 OdiTek offers end-to-end test automation services from Automation Planning to Tool Selection, Script development to Test Execution Monitoring, and Reporting for a wide variety of network interfaces and equipment etc. It has introduced the telecom test automation solutions approach for telecom labs, network operators and equipment manufacturers etc. Our system testing & QA services are designed to ensure maximum test coverage and handsome productivity gains from test automation. The product testing service in short includes from Test Authoring and Integration, Regression and Report generation till Test Automation installation and deployment, Test tool development and integration, Test script porting etc. It is always important to have the Telecom Automation approach cost effective, easy-to-use, and quality management framework that should run most leading VoIP, TDM, and Video test equipment (Empirix, Spirent, EXFO, IXIA, Agilent etc.) while simultaneously controlling other Devices Under Test (DUT) in the lab (Gateways, Softswitch, IADs, DUT/SUTs, etc.) via CLI commands and web GUI interfaces both. OdiTek has offered equipment manufactures and providers to improve product quality and reduce testing costs. 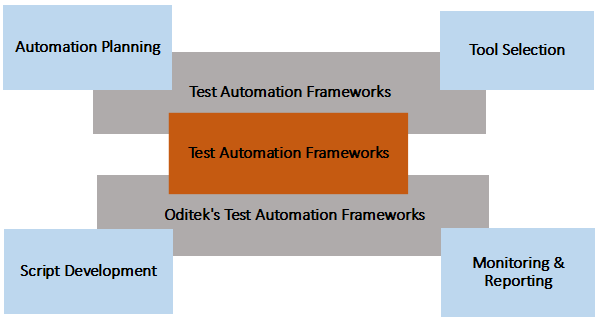 OdiTek’s test automation expertise extends across Network Devices and network testing. We have experience of working on different Telecom Wireless Simulators, Analyser products which help us with required acumen in determining right automation approach. capable of adapting to a wide range of configuration setups and environment. The Framework can provide capabilities to test the device through Command Line Interface (CLI) along with telnet or any communication protocol support. The product and test frameworks are customized based on the device to be tested. Basically the automation setup interacts with the Device Under Test (DUT) and other test equipment such as traffic generators, Real SUT etc., and executes the tests scenarios. Finally the execution logs results are generated and stored on the reporting server.